According to the American Cancer Society and the National Cancer Institute, nearly four million men live with prostate cancer in the United States – a number that is expected to increase to almost 4.2 million by 2024. While a prostate cancer diagnosis can have a variety of effects on these men, it is their partners who also take part in this journey as the unsung heroes. 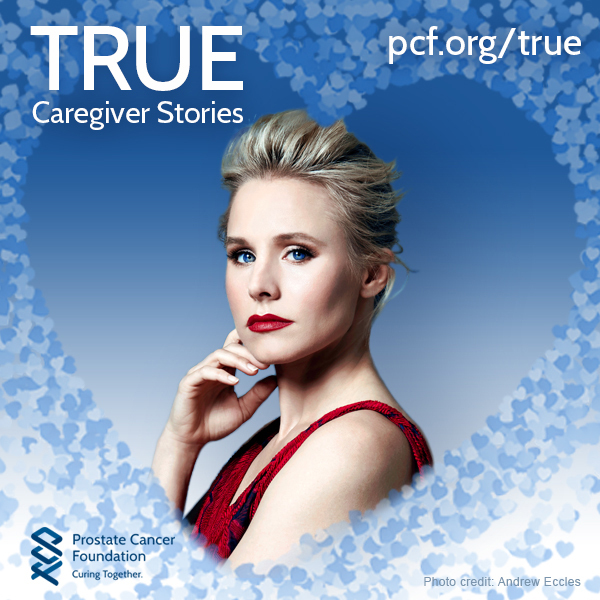 In the Prostate Cancer Foundation’s first annual TRUE Love Campaign, actress Kristen Bell helped to select two women – Wendy Dyer and Lynsi Piar – to honor as caregivers of men with prostate cancer. In her submission, Dyer, of Jonesport, Maine, talked about her more than 10-year prostate cancer journey with her husband, Bill. In her submission, Piar, of Millersburg, Ohio, shared her parent’s prostate cancer story – where both roles seemed to reverse throughout their journey. While choosing among hundreds of submissions, Bell noted that it was more than just the winners’ depictions of love that grabbed her attention most. In addition to the winners, an honorable mention was awarded to Warren Starks, from Casselberry, Florida, who shared how his pregnant daughter – who traveled across multiple states – cared for him during his journey. In his submission, he highlighted how she used laughter as a form of medicine to help him recover. The winners received a “caregiver package” curated by Bell. The TRUE grand-prize winners’ packages included a $300 Amazon gift card, a spa gift basket, a snugly blanket, a board game and “This bar saves lives” bars. The runner-up packages included a $150 restaurant gift card, and a snugly blanket and board game as well. Bell, who is married to actor Dax Shepard, has seen the true love of a caregiver firsthand – her father-in-law is currently dying of the disease. The TRUE Love Campaign is set to return on Feb. 1, 2019. To read the winning stories and to learn more about the campaign, visit: https://www.pcf.org/true/.